The Nests are an invitation for people to find comfort together; spaces of relaxation, contemplation, and conversation that are simultaneously public and private. 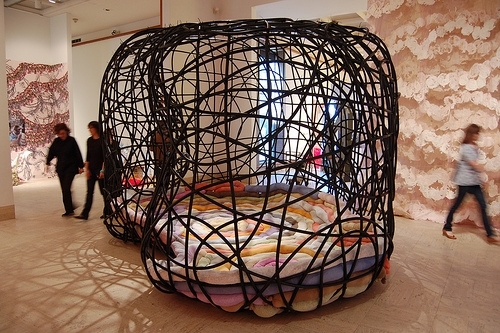 The Nests are constructed of polyethylene tubing, loosely woven and connected to itself. It provides an open yet clearly defined space, which is formed in response to its site. The materials used are commonly available and the method of construction is relatively simple, yet results in a complex self-supporting surface. The construction method allows shell spaces to be built in many forms and sizes, and in a short time. The material is suitable for interior or exterior applications and is reusable or recyclable.